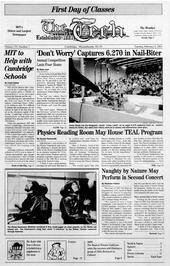 MIT will be asked to take a larger role in the Cambridge public school system under a “charter of responsibility” to be developed between the Institute and the city. In one of the most grueling finals ever, spanning four hours of competition, Don’t Worry, created by Brian Lin ’01 and Fred S. Lee ’01, narrowly defeated Maximus, designed by Sameer R. Dhond ’01, David S. Bailey ’02, and Eric A. Dauler ’02, to claim the 6.270 Autonomous Robot Design Competition crown. The Class of 2002 has been in negotiations with musical band Naughty by Nature to possibly headline a spring concert in March. The concert would be in addition to MIT’s annual Spring Weekend. Long after a destructive earthquake rocks the Richter scale and well after initial emergency relief efforts end, there remains the sizable task of rebuilding toppled communities. One new student-based humanitarian aid group is raising money for organizations that not only provide emergency relief but also eventually shift over to long-term disaster reconstruction work. Administrators and members of the Physics Department met yesterday afternoon to discuss the feasibility of the Physics Reading Room as an alternate location for TEAL, the controversial freshman physics program originally proposed to be housed in the fifth floor reading room of the Student Center.